Those looking for a respite from the heat, the animals, and the midway could stop and shop in the Merchants Building and the Coliseum at the Delaware County Fairgrounds. And it was hard to go away from either building empty-handed. For instance, expert gardening advice and free seed packets were available at the Delaware County Master Gardeners’ booth. The buildings were open daily during the fair from 10 a.m. to 9 p.m. And less than an hour after opening last Friday, Traub said she had counted 29 visitors to her booth. Also doing good business was the U.S. Army Corps of Engineers booth, where youth could take a quick water safety quiz and get their choice of a free prize. However, not all the booths were being manned at the time, and you know the saying about the early bird getting the worm. It was true, at least for The Delaware Gazette (yes, a shameless plug) over a competitor who shall not be named. Speaking of competitors, Delaware County’s Democratic and Republican parties both had booths in the Merchants Building, and it appeared the Republicans were getting more foot traffic. 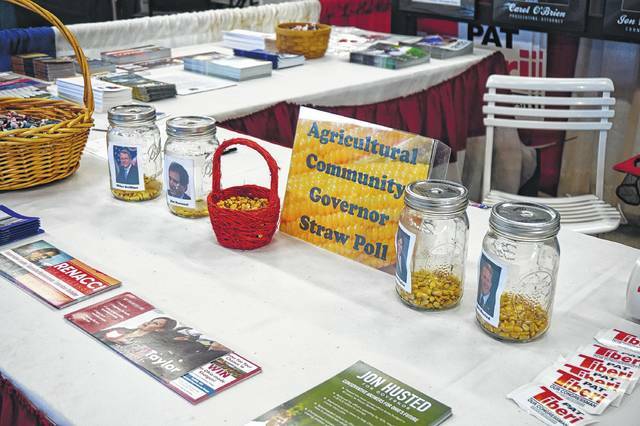 It may have helped that they had their own fun gubernatorial straw poll — placing a corn kernel in a mason jar for your favorite candidate. It looked pretty close, but current Lt. Gov. Mary Taylor seemed to have the edge. Many of the vendors we talked to said the Friday after the Little Brown Jug is generally their slowest day, but that didn’t stop some from putting the hard-sell on for, say, keeping leaves out of gutters. Others were laid back, and let the fair-goer inquire about their goods or services. Some of the exhibitors had been at the fair all week, and you could tell they were weary, but still friendly. Others said it was their first day, and they looked fresh and enthusiastic. You name it, you could get it: Home Depot Home Services; Able Roofing; Sleep Number mattresses; J.R. Watkins extracts and spices; Henna Fashions; Platinum Collection; Chiropractic; Champion Windows; DirecTV; The Gideons International; Jose Madrid Salsa; Mary Kay; Scentsy; Softub; Ohio Health; Mount Carmel (with mums from the Jug); to name just a few. Need a dress, a sports lanyard, or a puppet? How about an Ohio road map? All that and more could be found during the fair. The other fun thing about visiting these buildings is that you can find out about upcoming local happenings. As an example, the Delaware County Board of Developmental Disabilities is celebrating 50 years of county boards with its first-ever block party from 2 to 4:30 p.m. on Sunday, Oct. 8 at 7991 Columbus Pike, Lewis Center. And SourcePoint is having a dinner and auction to mark its 25th anniversary 6:30 p.m. Oct. 25 at 800 Cheshire Road. The Delaware County Republican Party offered this corny poll for governor during the county fair. 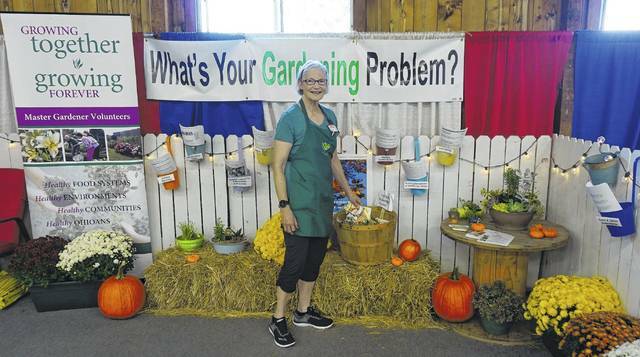 Nancy Traub of Galena, a Delaware County Master Gardener Volunteer, stands next to the free seed packets that were available at the Ohio State University Extension booth in the Merchants Building at the Delaware County Fair. For more information, please visit www.delawarecountyfair.com.